Here is one of my favorites. The Orlando, Florida ads in the 1970s featured this unique, eye-cathcing design at the top of a vertical newspaper ad. It features one wrestler applying a top wrist lock to another. 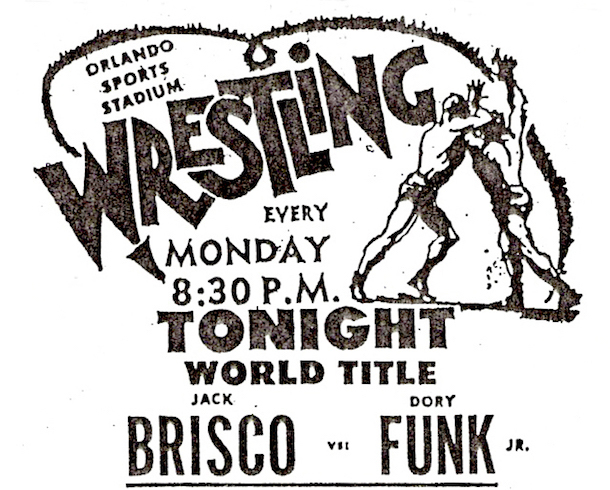 Here also, I've kept the main event, the definitive feud of the 1970s - - Dory Funk, Jr. vs. Jack Brisco. In this case, its August 10, 1970 and Funk is defending the NWA title.